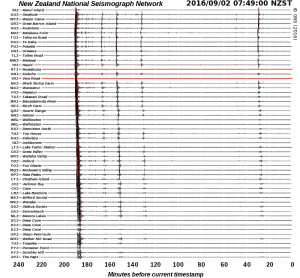 A magnitude 7.1 earthquake struck 125 km north-east of Te Araroa at 4:38 this morning. GeoNet reports that the earthquake was 22 km deep. The U.S. Geological Survey also reports the quake as magnitude 7.1, centred 166 km north-east of Gisborne at a depth of 19 km. 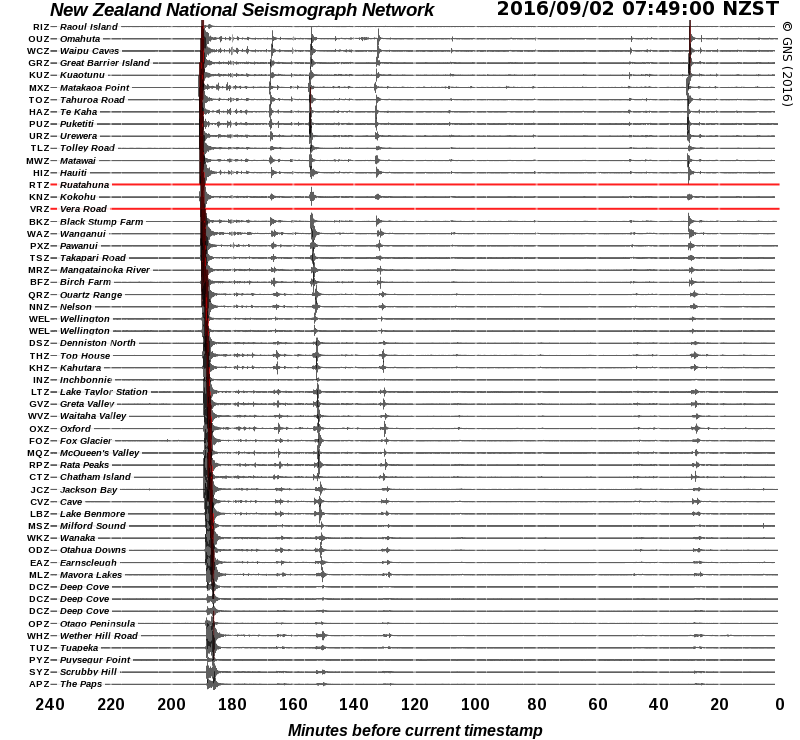 [click for larger image] This snapshot of GeoNetâ€™s New Zealand seismograph network shows the main earthquake and significant aftershocks to 7:49 this morning. 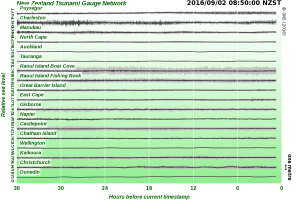 The quake generated a tsunami that was recorded on gauges at East Cape and Great Barrier Island. 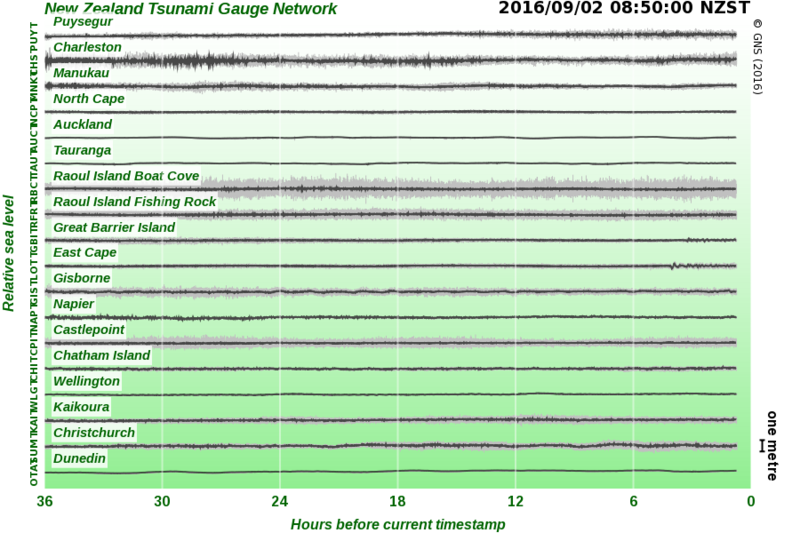 The first wave was detected at about 4:55 a.m., about 20 minutes after the quake. The largest sea level change was 30 cm. It is not yet clear whether the tsunami was generated by displacement of the sea floor or the triggering of an undersea landslide by the earthquake. A magnitude 5.7 foreshock struck the area yesterday morning. Significant aftershocks have followed this morningâ€™s earthquake. The U.S. Geological Survey reports seven aftershocks of 5th magnitude to 8 oâ€™clock this morning. GeoNet reports that a magnitude 6.2 aftershock struck at 5:14 a.m. and a magnitude 6.0 event occurred at 8:06 a.m. The Ministry of Civil Defence and Emergency Management issued a marine and beach tsunami threat statement for eastern coasts of the North Island from Northland to Mahia Peninsula. It is expected that unusually strong currents and water flows will occur near the shore for several hours. This entry was posted on Friday, September 2nd, 2016 at 9:09 am and is filed under Earthquakes - Observations. You can follow any responses to this entry through the RSS 2.0 feed. You can skip to the end and leave a response. Pinging is currently not allowed. This quake was very different from the normal, not jolts. I know now what I felt yesterday morning as it was similar sensations. Though would say the 7.1 one this morning was VERY strong, the seemed to be rolling in many directions and was a long time.